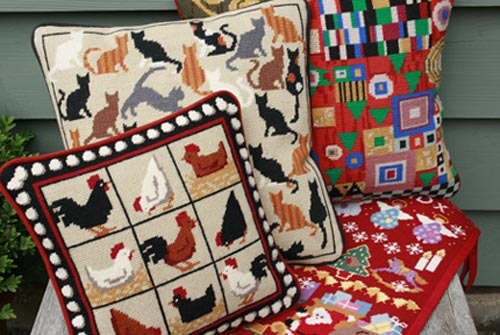 Today’s eagerly awaited Cushion (and Stocking) Making – ready to go back to stitchers; One Off Black Hens, Cat’s Whiskers and a Red Stocking plus an Ehrman Klimt tapestry. The Black Hens will be collected this afternoon and the rest will all be carefully packed up and posted. We are happy to make up tapestries from other designers they are priced according to size exactly as our own designs. This is the perfect time of year to send your tapestries in to our Making Service. There can be quite a rush in the lead up to Christmas so to be sure you won’t be disappointed, remember that November 1st is the last date for sending in to be sure we can return your finished items to you before then. There is no time like the present!